n Many people across the world know Antonio Negri as an internationally renowned political thinker whose book, Empire, co-authored with Michael Hardt, is an international bestseller. Much less well known is the fact that, up until 1979, Negri was a university professor teaching in Paris and Padova. On April 7th, 1979 he was arrested, charged with the murder of Italian politician Aldo Moro, accused of 17 other murders, of being the head of the Red Brigades and of fomenting insurrection against the state. He has since been absolved of all these accusations, but thanks to the emergency laws in Italy at the time, he was sentenced to 30 years in prison. Then, in July 1983, he was elected as a member of parliament, which meant that he was released from prison after four and a half years of preventive detention. After months of debate, the Lower House decided to strip him of his parliamentary immunity Ð by 300 votes in favour and 293 against. At that point he left Italy for exile in France where he remained until 1997 and continued to maintain his innocence of all the crimes of which he was accused. 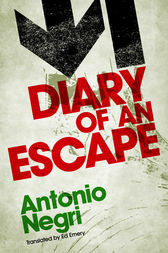 This book is Negri's diary in which he tells of his imprisonment, trial, the elections, and his escape to and exile in France. Both personal and political, it recounts a little known aspect of Negri's life and will be of great interest to anyone concerned with the work of this enormously influential political thinker.